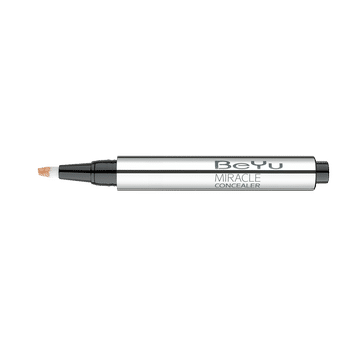 BeYu Hydro Miracle Concealer is a moisturizing concealer fluid that gives fresher and firmer facial features! It conjures up freshness and effectively covers up shadows around the eyes. Its pleasantly light texture covers up lines and skin unevenness. With a high-quality brush applicator. Perfect to apply around the eyes, nose and lips. Additional Information : BeYu is all about developing yourself. No mindless copying of what's supposedly fashionable somewhere in the world. Only you can be unique! The brand creates products that inspire you to experiment with and embrace every aspect of yourself. The personality of BeYu reflects current trends. BeYu stands for first class, skin-compatible ingredients, best textures and continuous optimization. A quality which can be experienced with all senses: from the high-quality texture to the modern and functional packaging. Ensuring this are the strictly audited production facilities and the very high-quality standards according to the strict regulations of the European Cosmetic Regulation. Alternatively, you can also find many more products from the BeYu Hydro Miracle Concealer range.